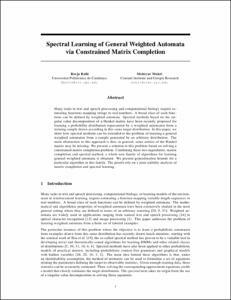 B. Balle; Mohri, M. Spectral learning of general weighted automata via constrained matrix completion. A: Annual Conference on Neural Information Processing Systems. "Advances in Neural Information Processing Systems 26: proceedings of the 2012 conference". Lake Tahoe, Nevada: 2012, p. 2168-2176.